The surprise wasn’t really that Andrea Fappani had won the Lucas Oil NRHA Level 4 Open Futurity, but the surprise was what horse he won it on, and how he did it. Spooky Whiz joined the Fappani training barn at the end of his 2-year-old year after Fappani purchased him through agent Eduardo Salgado for Rancho Oso Rio, an NRHA Million Dollar Owner. While the dark bay gelding was a bit on the small size, Fappnie could tell, even at an early age, that he had exactly the mind he was looking for. When Casey Deary slid into the 2015 NRHA Futurity Finals aboard a flash Palomino mare, her owner was just so happy that not only was she in the finals, but she was spinning in the middle of Jim Norick Arena in Oklahoma City. Rob Curtis is about strategy–management strategies for business owners to help them succeed, and strategies for building the next great reining breeding family. While he might seem all business, when you talk with him, you hear the passion he has for his business, his family and his horses, including Shesouttayourleague. I met Rob a few months after his mare catapulted Casey to Million Dollar Rider status when she won the 2015 NRHA Futurity and got to share his story for the Quarter Horse News. I thought it’d be fun to highlight Rob again because he’s the type of owner you like to talk with! Every winter stallions enter breeding sheds across the country with owners’ hopes of producing the next Spooks Gotta Whiz, HF Mobster, or Wimpys Little Step. Eleven months later mare owners wait with baited breath to see what possibly months or years of plan- ning has produced. Four long legs, a fluffy mane and tail, and a soft nose to nuzzle for milk can carry so much promise. 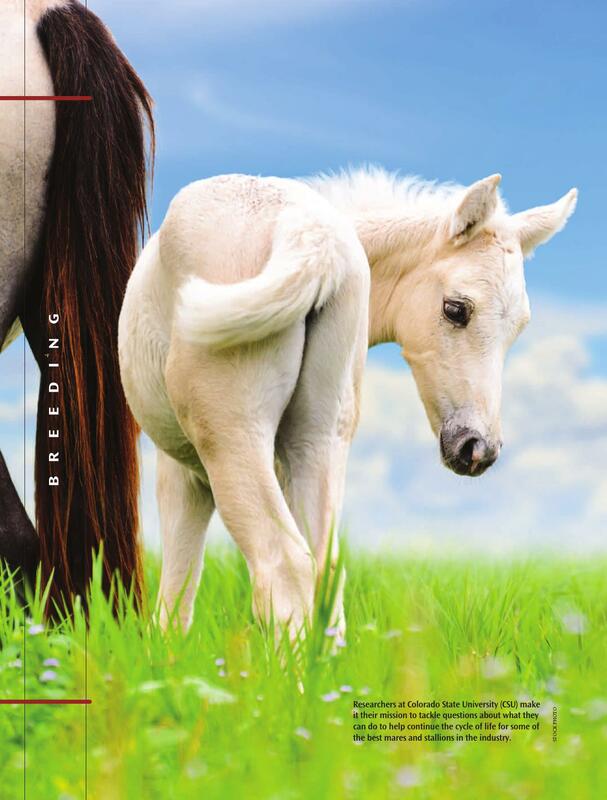 I enjoyed talking with the researchers at Colorado State University to get an update on what what reproductive milestones they’ve reached in recent years for the NRHA Reiner magazine. Things like helping older broodmares stay healthy, and how to keep the golden stallions viable for years to come. Read on to learn more about research from the December 2014 issue of the NRHA Reiner. Last week was a crazy one for me. I’ve learned it is particularly difficult to cover an event that is happening in France while you’re located in Kentucky. But, thanks to technology and social media, it wasn’t too bad. I was doing remote coverage of the 2014 Alltech FEI World Equestrian Games for the EquineChronicle.com and HorsesDaily.com. It was a lot of fun to watch as Team USA reasserted their dominance in the sport we’ve perfected, by not only winning the fourth (or four) Team gold medal, but also sweeping the individual podium, including having one of the few five-time WEG gold medalists in Shawn Flarida, and the first woman to stand on the individual podium with Mandy McCutcheon. During the event, I was lucky to be in contact with the owner of Andrea Fappani’s ride–Custom Cash Advance. 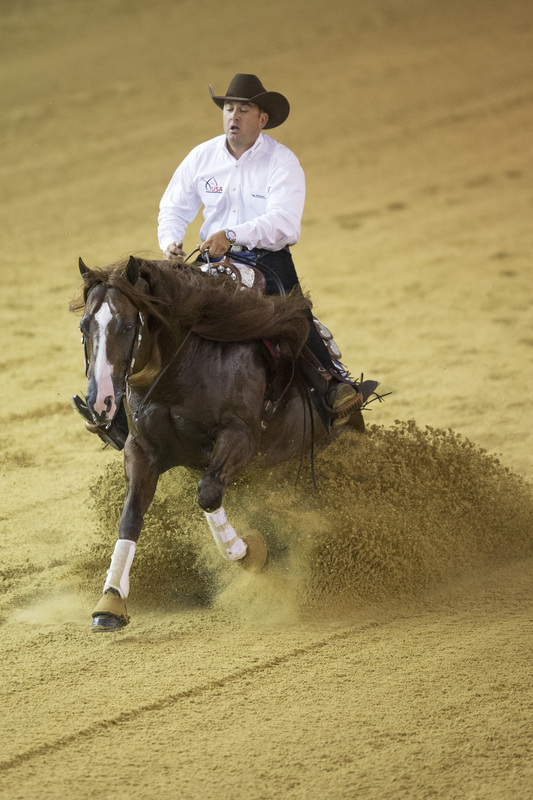 Michael Miola is one of those owners whose passion for his horses and the sport of reining might overwhelm you, but you know his heart is with his horse. In fact, Miola and his farm, Silver Spurs Equine, were lucky enough to have two horses qualified for reining Team USA with Fappani. However, when they determined Smoking Whiz wasn’t 100 percent, they decided to go all-in with “Cash.” Fappani and Cash came home with a Team Gold and Individual Silver, which is pretty good considering the pair had only competed together one time before heading to France, and that was for the team qualifier held in April in Kentucky. 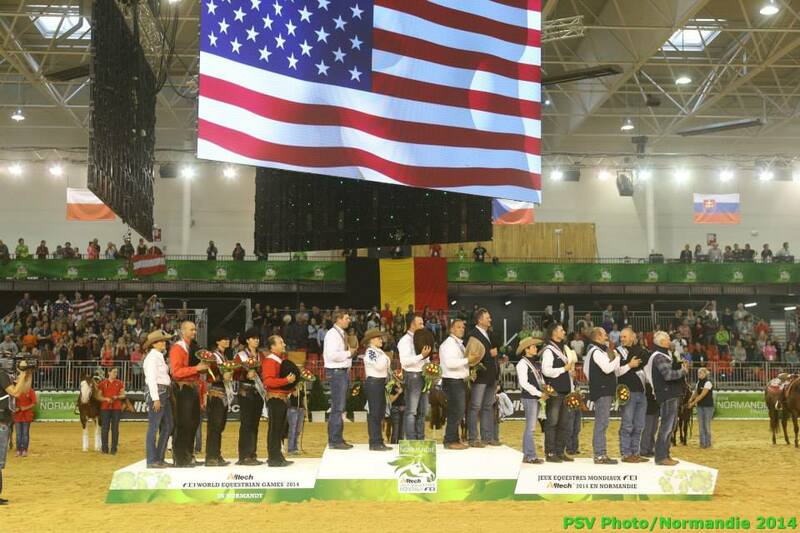 Each time they competed, though, their scores improved–220 in Lexington, 224 in the team competition in Caen, and 229 in the individual round. Pretty impressive. And, of course, there’s the golden girl in Mandy McCutcheon. Riding the big palomino stallion Yellow Jersey, she showed that her parents made the right decision in letting her take the reins for her first trip as a competitor (not a support like she has in the past for husband Tom, and father Tim McQuay). She lit up the arena with her smile every time she finished the pattern. She rode her heart out, and Yellow Jersey gave her everything he had. Mandy’s done just about all a Non Pro can do in her storied career, but to see a woman finally on the individual podium (and a German female rider came in fourth), was pretty awesome.